This is the definitive history of the KL! Every aspect of that horrific program is covered. I learned so much more than I thought I knew about the Holocaust and the concentration camp system. There are excellent anecdotes from both victims and victimizers that tell a more complete story of the KL system. It is so in depth in its coverage that there were times I needed a "palate" cleanser for my mind. It is really difficult but absolutely necessary to read this book. It elucidates and dispels so many conceptions and misconceptions people have about this issue. Importantly, this book is a lesson to us as a society to be every vigilant least we start a slide down that hellish slope! Mr. Hodgson's narration is superb. He has the talent to present a subject with the tenor it deserves and requires. My only detractor is the unnecessary reading of quotes with accents. It needlessly takes away from the levity of the subject to the point it becomes almost farcical. Whoever was in charge of that edit got it wrong. That being said, don't let that cause you to skip this recording. It is a minuscule detraction against this fantastic work of history. I know I will be listening to it again. 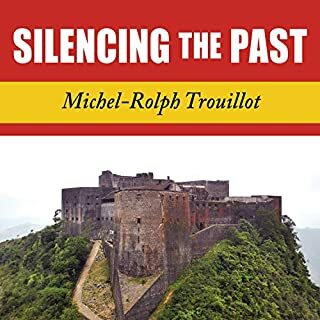 Would you consider the audio edition of Silencing the Past to be better than the print version? N/A I did not read the print. 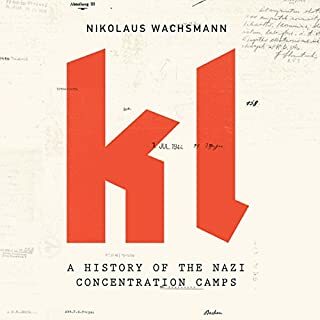 Before you consider reading or listening to a History account, read or listen to this book! This book will make you change the way you view and read history. Think you understand a Historical event, time, or personage? Think again. This book forces you to make a paradigm shift as how to receive historical information, even your own! Just because you experienced it doesn't make it the true historical account. Before assessing blame, condemning players, or bestowing prestige and according accolades, read this book and get a better understanding on how to read, study and understand History. If I ever teach History, this book will be week ones required reading! This is not a conspiracy theory type of critique. 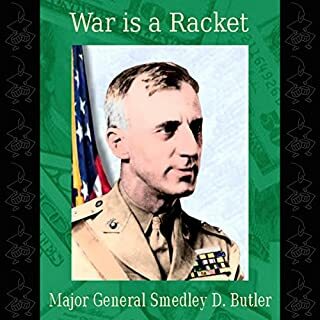 It is a well measured, thoughtful, and informed analysis of one of the realities of why wars rarely, if ever, serve altruistic or moral purposes. MG Butler was there, so this is not conjectural. Unfortunately the narrator sounded a bit cartoonish. I cannot imagine a MG in the USMC sounding like a carnival barker. Overall, this is an excellent short read, but well worth it. This is the story of the three-year ordeal of the Sandakan prisoners of war - a barely known episode of unimaginable horror. After the fall of Singapore in February 1942, the Japanese conquerors transferred 2700 British and Australian prisoners to a jungle camp some eight miles inland of Sandakan, on the east coast of North Borneo. For decades after the Second World War, the Australian and British governments would refuse to divulge what happened here, for fear of traumatising the families of the victims. What made the experience of listening to Sandakan the most enjoyable? What made this story "enjoyable" was learning about the sacrifice the Australians endured for their country and the allied, pacific war effort. What was one of the most memorable moments of Sandakan? Yes. Very moving. I had to control my anger about a people long gone and not shift it to their descendants. 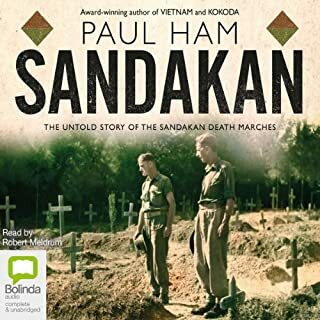 Paul Ham is a very knowledgable author and his stories are engrossing and necessary. I have read the majority of his books and each one makes me appreciate the "digger" more and more. I served with the Aussies in Afghanistan. Truly remarkable soldiers! On a chance visit to Plymouth Rock, Tony Horwitz makes an unsettling discovery. A history buff since early childhood, expensively educated at university - a history major, no less! - he's reached middle age with a third-grader's grasp of early America. In fact, he's mislaid more than a century of American history, the period separating Columbus' landing in 1492 from the arrival of English colonists at Jamestown in 16-oh-something. Did nothing happen in between? 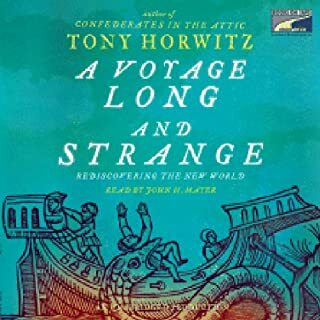 What made the experience of listening to A Voyage Long and Strange the most enjoyable? Mr. Mayer did a wonderful job of conveying the story as though he where giving a fireside chat. The fact that the author actually tracked down people and places that descended from the story of America and made the whole affair more human than history. Yes, it's a story of us, not necessarily about us. He shows that memories can be quite long, i.e., the story of the oldest city in America. The present inhabitants are still arguing over it. An excellent addition to anybody's American History reading list. What made the experience of listening to Washington: A Life the most enjoyable? 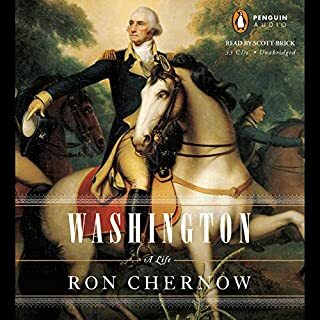 Mr. Chernow removed Washington from the pedestal history placed him upon, but didn't lessen his character, accomplishments, or appeal. Indeed, I respect and admire Washington more after this examination. A person's deeds are more the laudable when you know the shortcomings they overcame to achieve them. The Marquis de Lafayette. He really adored Washington and was a man of conviction who tragically suffered for it. Mr. Brick is a phenomenal storyteller! When he recites Washington's letters, he fully animates and fleshes out the great man to the extent you feel you can see him. Sheepishly, tears came to my eyes from the recount of Washington's death. Though I certainly knew it was coming, Chernow's description, and the way Brick presented it, was very touching. The atomic bombs dropped on Hiroshima and Nagasaki killed more than 100,000 instantly, mostly women, children, and the elderly. Many hundreds of thousands more succumbed to their horrific injuries later, or slowly perished of radiation-related sickness. Yet the bombs were "our least abhorrent choice", American leaders claimed at the time - and still today most people believe they ended the Pacific War and saved millions of American and Japanese lives. Ham challenges this view, arguing that the bombings, when Japan was on its knees, were the culmination of a strategic Allied air war on enemy civilians that began in Germany. What did you love best about Hiroshima Nagasaki? 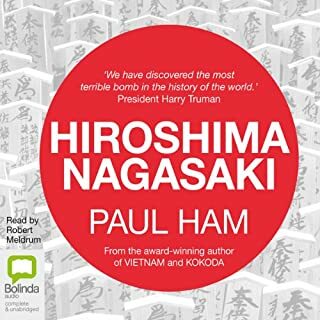 Paul Ham presents a honest and balanced account of the atomic bombings. Ham shows that no decisions, whether horrific or insignificant, can be pigeon holed as either a black or white finality by later day armchair historians. Ham presents the cacophony of voices that spoke for and against the use of atomic weapons and gives flesh to a few of the Japanese who survived the attack. I thoroughly enjoyed that Ham presented all sides, facts, opinions, and innuendoes and did not lead the reader, but allowed you to come to your own conclusions about this time in our history. I learned more about the Manhattan Project and the results of its work than any other source I have yet read. "Hiroshima Nagasaki" reads like a historic novel where I sometimes forget I already know the ending. What was one of the most memorable moments of Hiroshima Nagasaki? It was very illuminating to learn about the real reasons for Japan's surrender. Which character – as performed by Robert Meldrum – was your favorite? I thought Mr. Meldrum portrayed all characters very well, but I enjoyed his rendition of Roosevelt the most. This history of WWI is unique in that it hopes to explain the cost and causes of the war, economically, politically, militarily, and humanistically. This is not a "Sandhurst" study of the war, but what were it's multi-faceted causes and costs. This book is very academic and analytical but not boring due to it being so well narrated and so interestingly outlined. Many histories of WWI start with the assassination in Serbia and then progress through it's major battles. That information is necessary to analyze the warfare, but you are still left with the more important and nagging questions of why the war happened. This book goes a long way answering those questions. Every aspect is meticulously researched and explained as G.J. 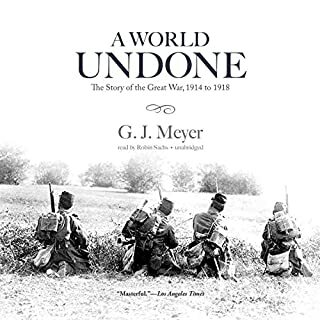 Meyer's reverse-engineers the design of this war leaving the reader with a comprehensive blueprint of its construction. I have listened to other Robin Sachs's performances and enjoyed this one all the more due to that fact. His reading style is methodical and calculated and does not over pronounce names and places. I was most moved by the economic value of death and the poetry the war inspired. Americans think of World War II as “The Good War”, a moment when the forces of good resoundingly triumphed over evil. Yet the war was not decided by D-day. It was decided in the East, by the Red Army and Joseph Stalin. While conventional wisdom locates the horrors of World War II in the six million Jews killed in German concentration camps, the reality is even grimmer. In 13 years, the Nazi and Soviet regimes killed 13 million people in the lands between Germany and Russia. Yes. 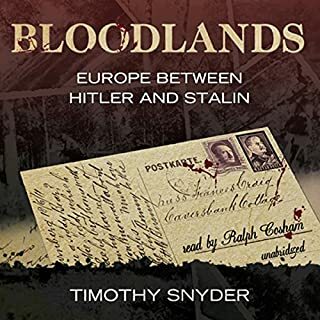 The Author tames the hubris with the humanity by showing that Hitler and Stalin were two sides of the same murderous coin and their victims deserved to be heard and acknowledged. 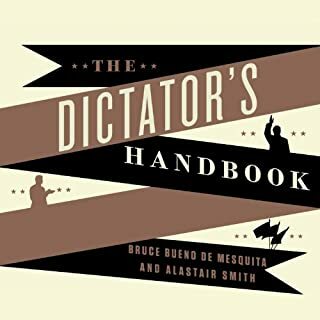 Many of the books about the events leading up to WWII give mention to the cruelty of these two despots, but they do not drag into the depths of the mud and despair that millions of people suffered due to their ethnicity or religious affiliation. This book is depressing, but necessarily so. We need to remember that the tragedy of any war is the loss of innocent and non combative lives. Mr. Cosham's tone and inflection were perfect. He made the story "enjoyable" by being able to give the necessary levity to the subject matter. Yes. I sat in my car in the parking lot at work not wanting to stop listening.